When examining rooms that I really love (both in photos & in life) I've noticed there there almost always needs to be some natural elements in a room for me to really love it. By natural elements, I mean wood (either stained or raw), textured materials such as natural woven shades, baskets or natural fiber rugs rugs, leathers, plants, etc. and I've noticed that that same feeling can come across in certain textiles, metals and paintings so often they serve that purpose. Below, I love this room by Betsy Burnham. The metal drum table, the inside of the fireplace, the lamp, and the bird figurines on the mantle, are these natural (brown as is often the case) touches I'm talking about. They ground the room just enough and make it perfectly livable & comfortable. I'm not saying that there aren't beautiful rooms without the natural element... because there definitely are... but for me personally to really fall in love with a room, I need it. Adding the natural element is simple. It can wake up a dead space like nothing else. Add some natural woven shades to your windows or bring in a big gorgeous fern (which is always semi-temporary in my case because of my black thumb). Add a natural fiber rug under your current rug for another layer of natural texture... Switch out some artwork, swap pillows, add textured blankets in, baskets, etc. Anyway, the kids are up and I hear giggles from the nursery so I have to run. Have a great day!!! Great post. Christian's bedroom is fabulous. I love sisal rugs and I tend to like neutrals so brown is definitely a favorite of nine. The third photo with the sisal rug is just perfect in my opinion. So true!! i really do think its the natural elements that make a room feel grounded and cozy. Thanks for sharing Lauren! Definitely agree and I love Christian's room- so sweet! 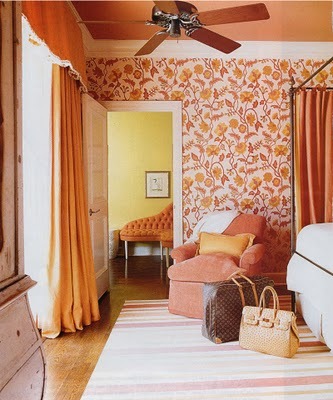 That pink space by Windsor Smith is one of my all time loves- gorgeous!! There's a whole lot here to love. Love the room with the Hermes blanket. And how great are you for helping us identify what will make our rooms better? it is great you brought this topic up. feel best about a room if there is natural texture. as you have pointed out in this post. and this is a tough one to describe to a client. Agree, agree, and agree some more. There is something about a green plant that just brings a space alive...I had never really thought about the wood acting the same way. 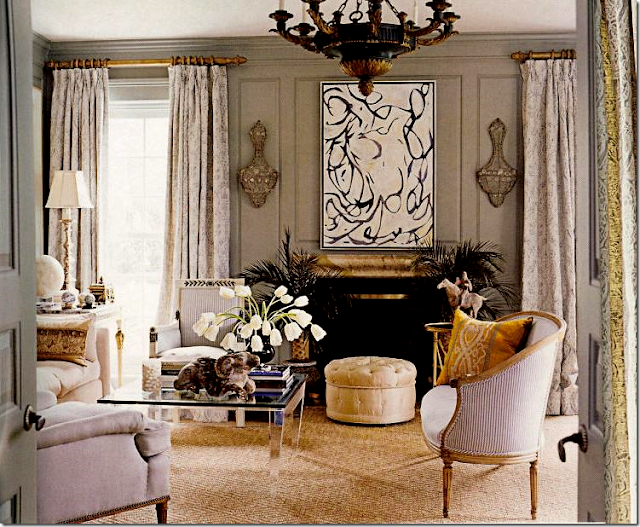 That Windsor Smith room is sooooo beautiful! agree too, it's that way with painting too...I see pretty paintings with all these gorgeous colors but lacking burnt sienna, umber, ochre or any other type earthy color...the painting usually lacks depth and seems a little flat after viewing for any length of time.. I totally agree with you! I feel like it warms a space up. Great pictures! The wood floors are coming in the Spring, natural fiber rug is next. I have the baskets & plants. I'd say I'm on my way to a Pure Style Home. Well put! Even the most formal of rooms look best with a touch of natural. Black and white plus wood is an absolute favorite--best of chic and comfortable. ps- I'm so bummed b/c I just realized that I won't be able to cover the dc design house for AT this year due to my pregnancy! I love the design house and was esp with year's newest hottest addition :) SOOOOOOOO siked for you! 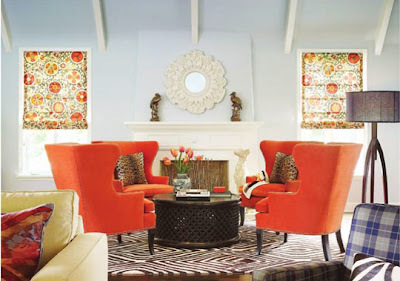 I love the room with the four orange-red wing chairs. I have always wanted to do that. :-) Love seeing color! Simply a happy post! Love your son's room. So fun! Lauren- So true! And your examples are wonderful! You're going to tell I'm buried in snow from this comment, but I love how a stack of firewood adds a natural element to a room. A neat birch log stack or a messy working log stack that fills a wall really does it for me right now. The natural element immediately warms me up and lures me in. I think it makes a house homey. I love natural beams, sisal, even in the most modern of settings...like boots with a dress. Great post! 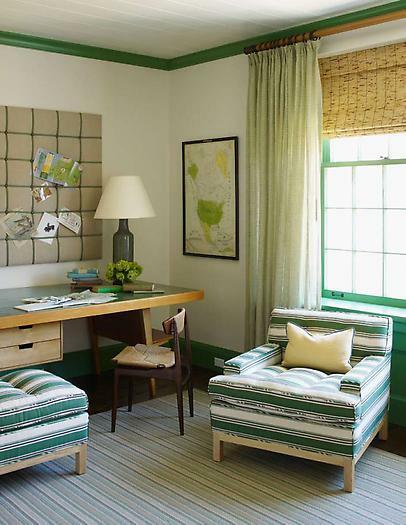 I love the woven shades in Christian's room. I have some similar ones in my living room. Also, it got me thinking about what I like and how I've decorated my house. Clothing-wise, brown has always been my go-to neutral instead of black, and that has definitely translated to my house, as well. I've never really thought about it as a natural element, just what I like, but maybe that's what it is. Hope you don't mind if I share your picture! So true, I totally agree and made sure to include natural elements in every room of my home. That living room by Gerrie B. is one of my favorites. Love it again! YOU are right on. I'm a warm girl myself but can definitely be attracted to monochromatic rooms and even brights at times. That's the difference. When the warm element is present. When it is not, I'm turned off completely! Thank you for this timely reminder! You've definitely given me something to think about as I ponder my bedroom. I'm with you about the natural element, for years I was a beige girl an suddenly got so tired of it and I'm all about the colors but alway seem to add a sisal rug or bamboo shades (my go to) it always makes the rooms seem a bit more adult!! Great photos with another great post! I'm looking forward to seeing the four chair arrangement in your new project. I did that in my living room and am so happy. on both ends of my livingroom is an entrance into another room (the dining room on one end and den on the other) so it made sense to do four chairs, making a more open look and not blocking visually either entrance. I love your son's room! Where id that bed from (trundle?) . . . also does he sleep in it yet? I have a 2yr old and wondering when to transition? my son'ts bed is ikea... we love it! where are the curtains from in your sons room? I love the rug in your son's room. Where did you get it?